Cruelty and sensual pleasure are identical, like extreme heat and extreme cold. Charles Baudelaire, "My Heart Laid Bare"
No other themes were so consistently embraced in Cézanne's early oeuvre as murder and sexual aggression. Violence was the vehicle for Cézanne's emergence from the shadow of Manet and the early impressionists, and this chapter will address why this was so. Murder offered Cézanne an antiaesthetic subject, one that paralleled a transgression of the law with his flagrant violation of the artistic, and even the avant-garde, standards of his moment. But, just as important, the topic opened onto the most defining problems of Cézanne's early work: the conflict between ethics and aesthetics, nature and culture, freedom and constraint; the anxious and often violent origins of human agency and creativity; the traces of the primal (and precultural) in modernity; the uncontrolled and uncensored elements of experiential immediacy. Murder, for Cézanne, was a highly charged scene in which the fraught binary of nature and culture exploded into modernity's most blatantly atavistic signs. He returned to the theme so frequently in paint because the nineteenth-century spectacularization of murder allowed him to represent how modern culture continually undid its own illusions of progress. Violence, and especially murder, offered Cézanne the most explicit means to represent the juncture between the will and the body, for flesh rests at the border between the two. This chapter offers the range of intellectual models mined by Cézanne to make atavism a prominent feature of early modernist art, from the contemporary definitions of animality, instinctuality, and prehistoricity to the psychophysiology underwriting Zola's naturalism. The intellectual circle of Cézanne's youth, in which Zola figures prominently, strongly favored a physiological, materialist explanation of human behavior. Its collective belief in a materialist account of human subjectivity-in which the body's somatic functions, and especially its nervous system, are the exclusive sources of all human action, emotion, and thought, including both artistic creation and violence-is fundamental to understanding Cézanne's work of the late 1860s and early 1870s. Here murder and love, digestion and art making, are radically continuous, if not interchangeable, and to paint the conditions and consequences of such a scientific model-so close to Zola and, more to the point, so far from Manet-became Cézanne's particular challenge. In representing murder, Cézanne attempted to circumvent the civilizing order, to return the act of painting to the primal urges of creative impulsiveness-a return that promised art's rejuvenation. As Joel Black has argued in The Aesthetics of Murder, "Often, however, the violence depicted in works of art seems directed against the idea of art itself, and should be seen as art's suicidal attempt to pass beyond its culturally conditioned self-image of falsity, and to achieve some transcendent or nihilistic-but, in any case, pre-aesthetic-'reality.'" This is only partly a contradiction, or a primitive fallacy, since Cézanne explored precisely the signs and expressions within modern culture, where the natural, instinctive, or precultural still seemed to emerge into representation. He was not after a return to a precultural order or a primitive state of nature in representation, but rather the deeply modern forms of cultural deterioration and regression. The subject of violence therefore allowed Cézanne to work through some of the central objectives and contradictions of his early practice at large: to show culture at the moment it is undone, to make art that partly negates itself as it takes shape. At the least, paintings such as Cézanne's early scenes of murder set out to unmask impressionism's propriety, as well as the limits-perhaps even the blindfolds-that the style placed on modernity's full array of experiential irrationality. Paintings that seek to challenge the standard rules of art should not allow any other rules, artistic or cultural; art that seeks the immediate and phenomenal should allow room for actions and thematics as rich, as uncontrolled, as life or death itself. At a time when much modern painting endorsed a vision of modernity shaped by normative understandings of bourgeois leisure, paintings such as The Murder (plate 2) partly worked toward reminding their viewers that modernity had other faces. The Murder is an exploration of forms of sociality, or rather asociality, produced and not always successfully quelled by the same conditions of alienation, fragmentation, and distancing we find in Manet. But to represent murder is not the same as to commit murder. As much as Cézanne tried to naturalize artistic representation through the depiction of violence-to make art equivalent to crime-he was also aware that he was constructing violent imagery, and not violent acts, as connected (but not interchangeable) as the two may be. In the late 1860s, Cézanne would have had at his disposal two distinct ways to understand the intersection between violence and art as a key site for marking the boundaries between the uncivilized and the cultured. The first version-Manet's-continually suspended death and nature in (or as) cultural codes, while the second-Cézanne's-sought to bring to the surface in painting the prerational features produced and only partially repressed by art and culture. On the one hand, murder was perhaps the best test case for the ways in which art could subsume nature, in that every act of brutality is always already fully part of the historical and citational vocabularies through which it takes place and is thus not antithetical to culture, but deeply structured and mediated by it. On the other hand, the relation between nature and culture can be thought of in more codependent terms: culture can be understood to desublimate nature and violence, allowing elements of "preaesthetic" naturalness, otherwise successfully suppressed, to linger and explode into visibility. Still in a rage, I set out on my way to Nice, rehearsing on the way every point of the little comedy I intended to play in Paris. I would go to my friends' house, about nine o'clock in the evening, when the family would be assembled for tea, and send in to say that the Countess M.'s maid is waiting with an urgent message; I am shown into the drawing-room; I hand over a letter, and, while it is being read, produce my pistol and blow out their brains, first of number one, and then of number two; and, seizing number three by the hair, throw off my disguise, and finish her off in the same manner, regardless of her shrieks. Then, before this concert of voices and instruments attracts attention, I hasten to deposit the contents of the remaining barrel in my own right temple, and if the pistol misses fire (which has happened before now), I shall at once resort to my small bottles. A charming comedy! It is a great pity it was never put upon the stage. And yet there were moments when, in spite of my wrath, I could not help feeling sorry that my plans, excellent as they otherwise were, involved my own suicide. It seemed hard to bid farewell to life and art, to go down to posterity merely as a brute who could not get on in the world; to leave my unfinished symphony, and all the other greater works which were seething in my brain. Berlioz had doubtlessly read one or another fait-divers and channeled his desire to kill through the mingling of fact and fiction in such sensational news stories. That the whole event had to be "theatrical" from start to finish seems a reflexive conclusion, the default mode of murderous action. Committing suicide was the only ending possible for such a tale, or the one most frequently supplied by the patterns of murder and its representations. But then, slowly, Berlioz tells us, he reasoned himself out of his plans and stayed behind in Nice for a month: "I write the overture to King Lear. I sing. I believe in God. Convalescence!" Berlioz regulated his impetuous passion and rage by submitting them to artistic form, creating an overture in which such emotions perpetually forebode King Lear's madness and jealousy, but not his own. Seemingly reflexive human impulses are anything but untouched by questions of art and the spectacular. The brutal, "uncivilized" urge to kill is generally fully sublimated into art: it is aggressively repressed by the social, and should it escape constraint, it ideally should transpire according to an artistic logic or it will be labeled senseless. "Rage," as Berlioz termed it, when taking textual or visual form, will be judged by the operations and standards of art as much as by those of morality: murder as a scripted play with its own theatrical rules of decorum; the murderer as actor who should be judged on the artfulness of his role. In this sense, Berlioz's autobiographical sketches participate fully in the growing (and perhaps distinct) nineteenth- and early twentieth-century sense of an "aesthetics of murder," as Joel Black and Jean-Michel Rabaté have called it, exemplified by the musician's keen desire to kill artfully and theatrically. Berlioz was supported in the writing of his diary entries by Thomas de Quincey's famous 1827 essay "On Murder Considered as One of the Fine Arts." De Quincey's polemical critique of Kantian aesthetics and art's disinterestedness considered the circumstances under which the ethics of killing are less important than the beauty and skillfulness of the act: "Murder, for instance, may be laid hold of by its moral handle, (as it generally is in the pulpit, and at the Old Bailey); and that, I confess, is its weak side; or it may also be treated aesthetically, as the Germans call it, that is, in relation to good taste." De Quincey based his distinction on the difference between acting and observing: if we can do something to prevent a murder, we are bound by the demands of ethics and active intervention; but if we are too late to intervene, we should participate "aesthetically" as spectators at a performance, as judges of the beauty and convincingness of the spectacle unfolding in front us. Cézanne's The Murder is deliberately unconcerned with the artfulness of the murderous act and the social powers of its repression. His is not a de Quinceyian image, or one close to Berlioz's memoirs. Cézanne was obviously aware that he was making a painting, but he sought at the same time to sever the act of murder in representation as much as possible from its theatrical accoutrements. Cézanne, instead, took the kind of primal, and not yet censored, fiction and fantasy Berlioz provided as his primary subject and wanted to show the act as not fully part of the drama and theater of culture, but residually attached to the primal mechanics of physical (re)action. In his scenes of violence, Cézanne tested the representability of murderous impulse before the operations of guilt and sublimation (of which, paradoxically, art was one) set in, or after they had broken down. The self's sense of futurity that slowly gained control of Berlioz was, for Cézanne, momentarily suspended or not yet put in place, enabling a return to the reflexive, the instinctual, and the unmediated as a central feature of contemporary life. Cézanne made paintings concerned with the antiformalist aspects of brute reactiveness, which sought to represent impetuousness as not inevitably and completely sublimated by the procedures of art. It is time to deliver the second textual tradition promised at the outset of this chapter: Baudelaire's imagining of violence. We know that Cézanne revered Baudelaire's writings deeply and that his Oeuvres complètes, published in the late 1860s, likely moved through Cézanne's hands repeatedly. 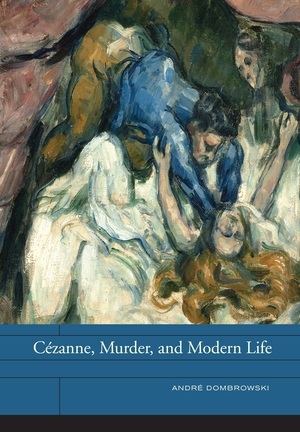 The essay that perhaps most exemplifies the topic-and that is closest in conception to the relation between crime and art, nature and culture, staged in Cézanne's The Murder-is "The Wild Woman and the Affected Coquette," one of the short prose poems in The Parisian Prowler, first published in 1862 and edited in their entirety in 1869 in the second volume of the collected works, shortly after Baudelaire's death. The prose poem is made up entirely of the interior monologue of an anonymous male narrator who takes his mistress or wife to a fairground in order to show her another model of the Feminine and another battle between the sexes. We are left uncertain as to the nature of their relationship, and do not learn much about their past or future. Trying to cure her from the "exhaustion of leisure" and what he perceives as her generalized disaffection, recalcitrance, and ingratitude, the narrator seeks to teach her "what real unhappiness is." He takes his "coquette" to a cage in which a woman is held by her husband, who feeds his "wild woman" live prey and regularly beats her for pure performative value. The fairground is a metaphor for the world at large; and their act has full cultural and legal sanction, since the caged woman is her violator's "legitimate wife" and he acts with the "permission of the authorities." We do not learn much about the coquette's reaction to what she is forced to observe, and the story concludes with the narrator's promise that he will treat her "like a wild woman" if she continues her whining, or-with a final eye on the complete objectification of the Feminine he desires-will throw her "out of the window, like an empty bottle." The short story is harrowing, in part because Baudelaire's famed misogyny here works in high gear: "That monster is one of those animals generally called 'my angel!' that is to say, a woman." But only Baudelaire could have conceived of the story's false opposition between nature and culture in which neither term can maintain precedence. Rather than contrasting the realm of the natural or the primal to the overly refined sphere of cultural affectation, as the title might at first suggest, the tale turns on how "nature" appears precisely as an artificially induced expression-taking place in a fairground after all-and "culture" as an almost natural sign. We get to know the "affected coquette" only through her visceral reactions: she is almost petlike, sighing continually, waiting to be caressed, and conveying only the "satiation of well-being." At the same time, the "natural" appears only as part of the spectacularity of the stage performance: the woman, a "hairy monster," copies "to perfection" an orangutan, a tiger, or a polar bear; she tears apart her living prey "voraciously (perhaps not feigned! )"; when she is beaten, "she howls more naturally." Baudelaire has come full circle: nature is a product of the fairground, and overacculturation finds its best expression in the elemental terms of nonverbal, corporeal communication. These are complex destabilizations of originality and its imitations that refuse to grant logical or temporal priority to either nature or culture: is she an animal? Is she acting or not? Does the pain inflicted during the performance unleash expressions more natural than any the precultural realm could be imagined to produce? Such are the contradictory cultural conditions, Baudelaire claimed, that produce the "natural" as a countersignifying practice in modernity. Baudelaire in fact established a more anxious and reversible relationality between the two terms than did de Quincey or Berlioz: the woman's "natural instincts have been unleashed by the performance itself"; she enacts a "hyperbolical naturalness," as Debarati Sanyal argues in her study on Baudelaire. Baudelaire differs from de Quincey in his conception of the role of violence in art. For de Quincey and Berlioz, murder is always already a performance, and thus fully part of the realm of art. Even the act of murder does not escape or momentarily transcend the reach of culture, for nothing can. For Baudelaire, prefiguring Freud, violence and nature are expressions of the primordial within the realm of culture, its genetic origin and governing code. And even if they are fully induced by culture-like a fairground performance-they nonetheless have the power to shatter, if only momentarily, the link between repression and civilization. I insist in what follows that these contradictory views of violence in art mattered for Cézanne when he repeatedly considered murder as a subject. It is moments such as the one described by Baudelaire-a moment in which culture becomes its own primordial and unrepressed other-that Cézanne too sought to picture. In making such pictorial terms his own, Cézanne simultaneously marked Manet as a painter upholding (rather than dismantling) the sets of rules, sanctions, and limitations that over the centuries have been placed on the realm of culture and the act of painting. Murder was Cézanne's surest countersign to Manet, one that branded the painter of Olympia as an old-master academician. Cézanne's depiction of Zola's universe of natural determinism-best expressed in the 1860s in Thérèse Raquin and other novels whose crime scenarios The Murder certainly sought to approximate-demonstrates modernity in opposition to Manet's paradigm. For Manet, the body is under the mind's control, and mind-at least while a tense pose is held-triumphant. The blasé attitude, in Manet's understanding of modern subjectivity, is a calculated refusal to act on bodily demands, and thus becomes an exteriorized sign of the mind's superiority over the body's expressive and impulsive potential. For Cézanne, the opposite is true. In a painting such as The Murder, the intellect seems to have lost its power and control over bodily impulses, and, as a consequence, a governing conscience that could reflect upon and, if necessary, censor the body's desire for instinctual expression cannot be located. Instinct and passion, so absent in avant-garde painting of the 1860s and 1870s, reemerge here more strongly than any other forces. Cézanne's is a bleaker picture of the modern condition than Manet's, and even less subject to amelioration or "progress." In his choice of themes, he created a vision of contemporary life (and its new forms of sociability) far less confident in the possibility of individual agency. But it is she [Nature] too who incites man to murder his brother, to eat him, to lock him up and to torture him; for no sooner do we take leave of the domain of needs and necessities to enter that of pleasures and luxury than we see that Nature can counsel nothing but crime.... Crime, of which the human animal has learned the taste in his mother's womb, is natural by origin. Virtue, on the other hand, is artificial, supernatural, since at all times and in all places gods and prophets have been needed to teach it to animalized humanity, man being powerless to discover it by himself. Evil happens without effort, naturally, fatally; Good is always the product of some art. If, as Baudelaire maintained so importantly for the rise of modern-life painting, modernity finds its best expression in our most ephemeral desires and is embodied in fashion, prostitution, and flânerie, then murder is the ground, the eternally recurring antithesis to the temporality of the fashionable. As in Cézanne's The Murder, violence is primal, always the same, never specific to any singular situation or moment. Thus murder offers the most compelling picture of the "natural" of any: an unconverted state within the State, raw and uninhibited, its layers of decorum and repression peeled away. But what pictorial problems did the choice of murder as a quintessentially modern theme open for Cézanne, and how did he solve them? Cézanne worked on the theme of murder from the late 1860s to the early 1870s, yet his medium-size painting The Murder-at roughly 26 by 31 inches a standard drawing-room format-remained his most elaborate treatment of the theme of violence. A man-anonymous, his face covered by his right arm-raises a knife to plunge it into his female victim on the ground. A female accomplice, holding (pressing) down their victim with her substantial body, abets the act. Her face turned toward the ground, she is hardly more individualized than her partner in crime. Night has fallen over their actions, offering cover. Engaged in a crime without witnesses, they have left civilization and its imperatives far behind: there are no lights in the background, no street leading off into the distance. All we can glean is that the murder must be taking place on a sloping hill, and that there is a distinct drop-off behind the accomplice. The victim, stretched out in front of us, is turned toward us on the slope. Only after we have settled on those minimal characteristics of the territory do the strange angles and acrobatics of the two murderers-pushing their victim into the mud while standing-make some rudimentary perspectival sense. In general, however, the painting refuses to construct much distinction among land, water, and sky-air is here as heavy and substantial as dirt-leaving the impression that this violence is "nowhere in particular and thus potentially everywhere." In Cézanne's painting, we confront both an antilandscape and an antitopography. No landscape Courbet or Monet ever painted is this unspecific. There seems to be a Styx-like river in the dark background, but the site does not open itself much to the viewer. Finding a universal form for an anonymous act, Cézanne sets his particular scene of murder at once anywhere and nowhere, a generality despite its graphic particularity. The Murder refuses to provide the identities of actual perpetrators and victims that could locate the crime in favor of a ceaseless, faceless cycle of human violence. What matters in this world is not who killed whom, or when, but rather that killing and dying happen, transcending the local and the specific. His color choices, too, become legible in this context: that the killer and his victim wear the same blue, that his shirt replicates the color of her skin, and that the victim's hair has a yellow tone similar to the accomplice's blouse, can hardly be coincidental. Cézanne does everything to deindividualize the figures and strip them of sentience; the killer's back is turned, and, fully immersed in the action, both he and his accomplice are unaware of the viewer. That the defenseless female victim can summon little resistance makes the extreme violence of this crime all the more senseless, its savage execution all the more driven and impulsive. The poor victim hardly requires this energetic debauchery-she has the look of a corpse even before the knife has struck home. Her left hand simply hangs, mere matter subject to gravity, at the edge of the lower picture plane, which seems to prevent it from free fall. To distinguish between her body and the ground is difficult: where her dress ends and the dirt begins is hard to establish with certainty; her hair is depicted as if already dissolving into earth; and her skin is grayer and muddier than that of her attackers. A comparison to how death figures in Manet is instructive. Lying on a monochrome gray ground like Cézanne's female victim, and with an arm likewise outstretched, Manet's Dead Toreador of about 1864 (figure 8) seems the ultimate counterimage to Cézanne's victim. Even though the two figures share much in terms of posture and positioning, their demeanors in the face of death could not be more different. While the victim in Cézanne is an unresponsive lumpy flesh, Manet's bullfighter's left hand is still flexed, grasping a pink cloth, while his right hand rests dramatically, and fully posed, on his chest. Minimal blood has been spilled in Manet's painting; we see only a little on the toreador's shirt and some on the ground (but it could easily be mistaken for a shadow). Even in death, Manet's protagonists are depicted as if alive; the animating will has not yet flown the body. Moreover, Manet's limited range when it came to imagining death and violence is nowhere better evidenced than in the fact that he recycled The Dead Toreador's posture for his 1871 print of a dead Communard, and that the composition of The Execution of Maximilian had to double as his tribute to the execution of Communards. For Manet, death had only a delimited expressive potential and gestural range; it was merely the cessation of sociality that interested him. The drama of violent death was unrepresentable, for being was equated with the exercise of bodily control, and death was mere endgame. Indeed, the body in death figured in Manet only as an extension of life, a self-aware maintenance of one's composure before others. In Cézanne's depictions of death and violence, by contrast, life comes to an abrupt and impulsive end. Life gives way to death not as its opposite, but as its companion, through the eruption of instinctuality and aggression onto an uncomposed-almost decomposed-body. It is noteworthy that Cézanne's scene is not exactly "dramatic" either, or filled with theatrical details, but is pared down to a sense of ritual. Some ingredients of this theme would remain constant throughout his years of preoccupation with murder: a female victim, often passive, lies on or close to the ground, strangled or stabbed by a male aggressor towering above her. A female accomplice usually aids the murderer. These general features of composition, which Cézanne adhered to religiously, reinforce the theme's unconscious immediacy, as if there is something unstoppable to this course of events: like planets in their orbit, these bodies do what they were made to do, the murderer coming down hard on the passive female victim-all trapped by natural laws not of their own making. Cézanne, Murder and Modern Life offers an original approach to early French modernism, one informed by the art’s unprecedented psychological intensity. Focusing on the early work of Paul Cézanne, it offers a competing version for modern painting rooted in the evocation of emotive “expression,” emblematized by scenes of murder, sexual violence, and anxious domesticity. Mobilizing contexts rarely brought to bear on our understanding of art in the age of Impressionism, let alone the work of Cézanne, this book investigates the “culte du moi” and the conceptions of authorial function in art and literature, theories of neo-romanticism and early symbolism of the 1860s, as well as psycho-physiological analyses of the human mind and other positivist theories of modern sociality and instinctuality popularized during the Second Empire and early Third Republic. "Cézanne, Murder and Modern Life changes the way we think about—and see—Cézanne’s entire oeuvre. Dombrowski’s arguments are convincing and bold, especially on the theme of murder as a vehicle for representation. Modern Olympia has never before been so satisfactorily analyzed."